Not to get all Grinchy here — especially after Jose Feliciano’s beautiful guitar playing post this morning — but alert “06880” reader David Meth is not exactly in the holiday spirit. What has happened to Westport? A cold, colorless Main Street, and the chill of a blue tree in front of Town Hall that is uninviting in the yellow shadow of a street light. At least Millman and Aarons added colorful flickering lights to their tree, diverting attention from the awful skeletons of white lighting on the little green across from Town Hall. But Main Street did have white lightning bolts zigzagging from the tops of poles. Is it any wonder why Main Street has been dying a slow death and the town is like a graveyard at night? No imagination. No color. No spirit. No trees, but zigzagging lights. This entry was posted in Downtown, People and tagged Christmas 2013, David Meth, Main Street. Bookmark the permalink. I must say I have wondered the same thing. In years past (and not all that long ago) Main Street in Westport looked like a Norman Rockwell scene. The lights on the trees were stunning. I used to go out of my way to drive up Main Street in the evening, during the Christmas season…why the change? It is deplorable. Some merchants like Lee Papageorge (Oscar’s) have tried to keep it going like years passed, but to no avail. They are chain stores now , not the mom and pop stores of yore. Is it a wonder then that they don’t thoroughly clean their sidewalks, they don’t care, it’s just “bah humbug, but do come in and buy” in the spirit of the season; we like your money but we really don’t care about you. It’s your affluenza we like! But in spite of all that……..Merry, Merry Christmas to all, happy holidays. I moved away in 1984…I remember downtown with colorful lights and fun window displays…too bad, if that is what it looks like now that is really sad…especially in a town noted for all the artists that live there! Looks like David and the prior respondents have a quorum to form Westport’s new holiday décor committee. Would love to see more engaged solutions oriented residents. It’s always easiest to critique the effort of others. 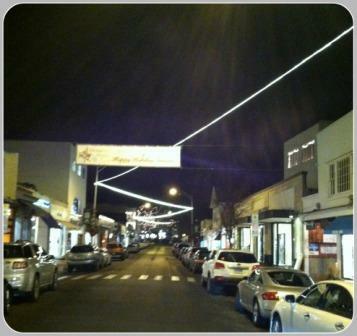 At least some stores are sporting their own lights, notice the windows above Banana Republic, that’s M3Yoga, namaste. We will make every effort to re-green Main Street this Spring, working with the downtown merchants. Preliminary discussions will take place in early January. I’ve read many comments about the trees on Main St being cut down, but I don’t remember reading anything explaining why they were removed. Can anyone explain what happened? A couple of Westport News stories give background. We will make every effort to re-green Main Street this Spring. I know…it’s a futuristic holiday Traffic landmark…turn right or left at the zig zagging led rope light on Main Street!!!! Then shop till you drop on a treeless street! This is our town. Let’s be positive and work with whoever is in charge of the lights and make next year a better year. It should not be difficult. Keep the holiday spirit and maybe volunteer to help.